Magic Tracks | Buy One, Get One Free! Looking for Magic Tracks Turbo RC™? Click Here. Guaranteed Christmas Delivery When you upgrade to FedEx 2 Day Shipping Order Now! Magic Tracks® are the totally new cool race tracks that bend and glow like you’ve never seen before. You can bend, flex, and curve the track magically in 360˚ however you want – even while the race car is zooming around. Just snap the pieces together and you get a fully customized speedway of your own creation. And even better, when you turn off the light, Magic Tracks® glows super bright! YES! I’d like my BONUS Magic Tracks® Set for just an additional $5.99 P&H! How many offers would you like? Make Even Bigger Tracks with Our Expansion Kit! 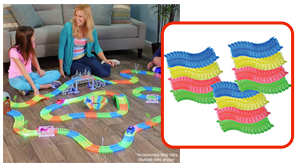 By ordering today, you'll receive 1 set of Magic Tracks® for just $19.99 plus $5.99 shipping and handling (complete with 220 Track Pieces, the Translucent LED Racecar, Decals for Total Customization, the Storage and Travel Pouch and Fun Track Guide). Plus, we'll DOUBLE the offer and include a second set - just pay a separate $5.99 P&H. This offer is covered by our 60-Day Money Back Guarantee. Sales tax will be applied to orders from NV and NJ. A $1 web service fee will be added to each order. Non-continental U.S. orders please add an additional $29.99 shipping surcharge. For customer service, please call 1-800-793-5469 or email magictracks@rephelpdesk.com. To check the status of your order, please click here. ©2019 Magic Tracks® All Rights Reserved.